Only 6 days 'til Christmas. I'm sure many of you are busy with all the holiday preparations--- buying and wrapping gifts for family and friends...cleaning and decorating the house...thinking of what dishes and treats to prepare. Wheew...the holidays are indeed the busiest time of the year and can bring so much stress into our life! I, for one, love the holiday season and want to enjoy it to the fullest. Putting myself under so much stress during this special time of the year is a complete NO NO for me...that is why I do all my Christmas shopping and decorating in advance...and I try not to take on difficult recipes that consume a lot of my time. I don't want to be in the kitchen all day and miss all the Christmas festivities, you know...so I prefer sticking to my tried and favorite recipes like this one I am sharing with you today. I got the recipe for this from the box of Pepperidge Farm® Puff Pastry. You may think it's difficult to make but it's actually very simple and really quick to prepare. What I love most about it is that you can be flexible with the filling. 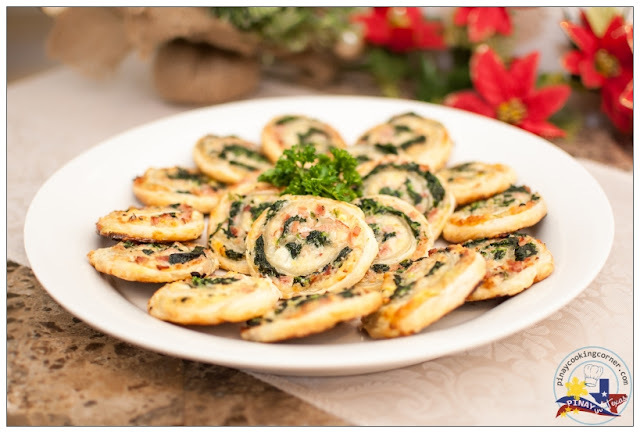 For this, it's cheese, ham and spinach which make these pinwheels perfect appetizers...but you can fill it with anything you want. If you want it savory, you can try other combinations like sun-dried tomatoes and pesto, bacon and cheddar, or pepperoni and cheese. If you want to make a mouthwatering dessert, you can use apple caramel, apricot, cherry or raspberry for filling. The possibilities are endless, I tell yah! If you want to prepare something for your Christmas feast that only takes little time and effort, you should definitely try this! Making these pinwheels is fun and easy, and your guests will surely love them! 1. Preheat the oven to 400°F. Line 2 baking sheets with parchment paper. Using a fork, beat the egg and water in a small bowl. In another bowl, mix the cheese, onion and garlic powder. 2. Dust a flat surface with flour and unfold the pastry sheet on it. 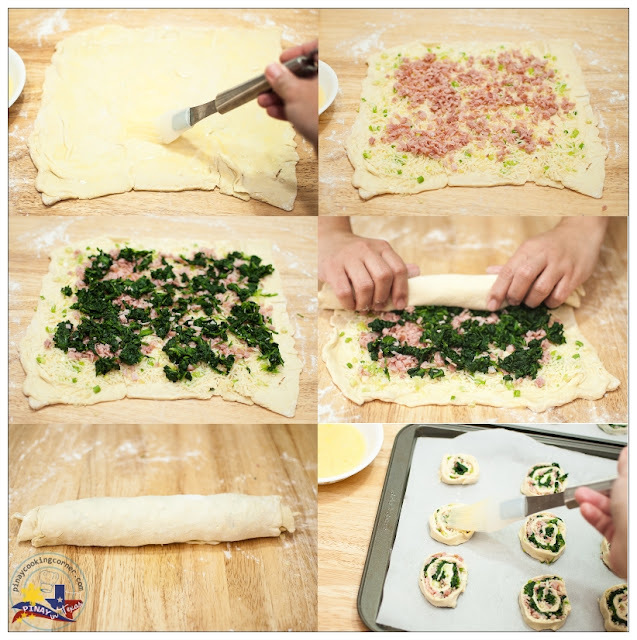 Brush the pastry sheet with the egg wash then top with the cheese mixture, ham and spinach. Starting at a short side, roll up like a jelly roll. Cut into about 20 (1/2") slices. Place the slices, cut-side down, on the prepared baking sheets. 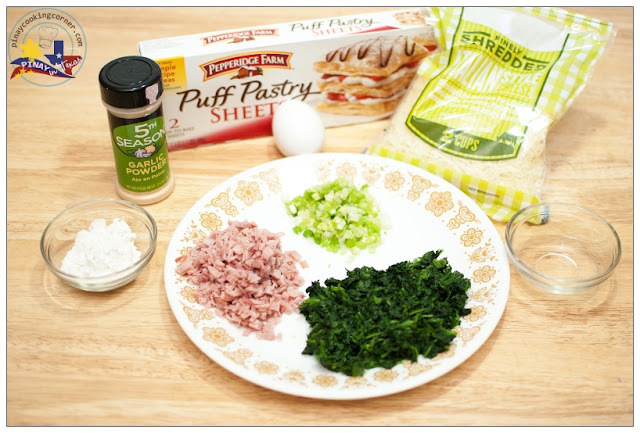 Brush the slices with the egg mixture. 3. Bake for 15 minutes or until the pastries are golden brown. Remove from oven and transfer to wire racks. Allow to cool down for about 10 minutes before serving. I too thinking of making pinwheel. Looks delicious Perfect. Tina. Hi Tina, how are you? 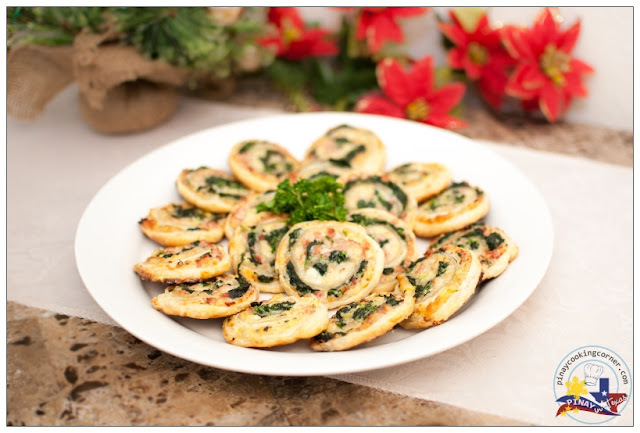 Your pinwheels look delicious and appetizing. You roll it so nice and neat. Yummy! Wishing you a very Merry Christmas and a Happy New Year to you and family. God Bless. Lovely pinwheels ..love the combination. These look delicious and your photo's make them look so easy to make.